In recent years, Leonardo DiCaprio has become an outspoken environmental voice. Earlier in 2016, he hosted “Before the Flood,” a National Geographic documentary about climate change, and interviewed President Obama about climate action at the White House’s South by South Lawn festival. Now the actor-turned-activist is hoping to create a new model for green hospitality. DiCaprio is helping design a new resort called Blackadore Caye, A Restorative Island. Slated to open in late 2018, it will be located on a small island off the coast of Belize. Blackadore Caye (which is also the name of the island) will feature 36 resort bungalows and 36 estate homes, all of which will be powered by 100% renewable energy harvested from solar panels. Rainwater will be collected and filtered on-site and combined with solar-powered desalinization devices to meet the resort’s water needs. Master plan for Blackadore Caye developmentDenniston International Architects & Planners Ltd.
DiCaprio purchased the island more than 10 years ago for $1.75 million. Though its 104 acres are unpopulated, the island’s beaches and reefs suffer from overfishing, an eroding coastline, and deforestation of the native mangrove tree population. According to the New York Times, fisherman have cut down the coastal mangroves over the years, using the wood for fires to cook fish and conch from the reef. The depletion of the mangroves has allowed more seawater to breach the island’s shores and wash away nutrient-rich soil. Without the natural storm barrier the trees provided, saltwater has also penetrated the island during extreme weather events, and the lingering saline has caused some plant species to die. To reverse that trend, the development team has assembled a group of scientists to set baseline levels of resilience and biodiversity, and monitor those factors over time. The project’s plans include planting approximately 20,000 new red mangrove trees around the island’s perimeter, and fortifying the shoreline by adding strategically placed rocks and sand. Native species will also be reintroduced to restore the island’s vegetated cover. Half of the land will be set aside as a wildlife preserve, and a research station will be established to host scientists conducting ecological studies. Guests will also be invited to work on some restoration projects if they choose. 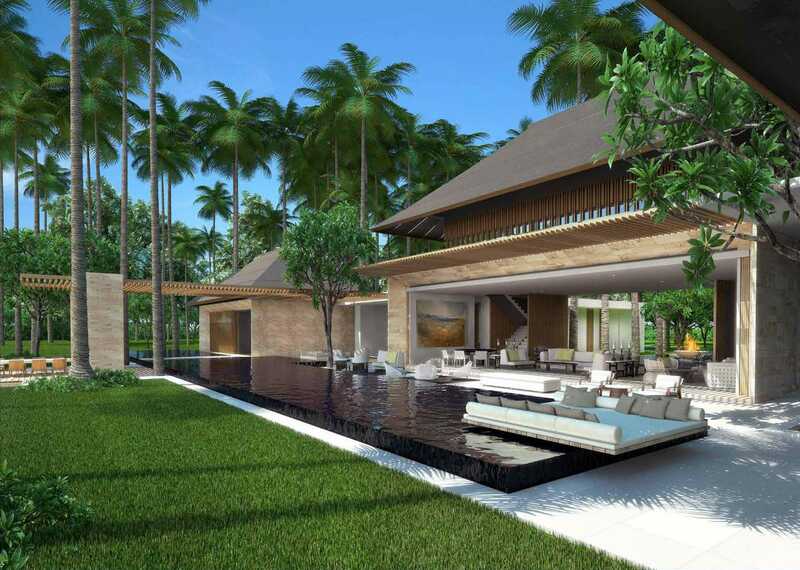 A rendering of an estate at Blackadore CayeDenniston International Architects & Planners Ltd.
Blackadore Caye will be the first luxury resort to adhere to Living Building Challenge standards, the most rigorous sustainability certification for buildings. Though the square footage of the bungalows and homes has not yet been released, all of the energy-efficient buildings are being designed to capture breezes and keep out heat from the sun. Both human and food waste will be treated on site and composted when possible to improve the island’s topsoil. There will also be a strict list of items and technologies not permitted on the island. All recreational vehicles (boats, cars, scooters, etc) will have to use clean energy, and guests will be forbidden from bringing non-reusable plastic water bottles. The food served to resort-goers will be organic and locally sourced — the developers plan to partner with local fisherman and farmers to stock the kitchen. Some greens and produce will also be grown hydroponically on-site. For a sizeable number of today’s one billion tourists, the prospect of pristine mountain slopes, sun-drenched beaches and nature at its best is worth traveling long distances for. Yet for all the good they do for local economies, a steady stream of tourists can also have a significant environmental impact as infrastructure springs up to accommodate their needs while increased water consumption and waste generation put pressure on local resources. The U.S. Green Building Council (USGBC) estimates hospitality’s annual footprint to total around $4 billion in energy use, 1.2 trillion gallons of water and millions of tons of waste. The global hotel sector, comprising some 175,000 hotels, offering 16.4 million rooms worldwide and generating revenue in the region of $550 billion last year, accounts for around 1 percent of global emissions, on its own. Inevitably, these numbers support the case for sustainable development. The United Nations has even named 2017 the year of sustainable tourism. “Sustainable development can only be achieved long-term if we manage to balance economic and social prosperity with environmental integrity,” says Franz Jenowein, Director, Global Sustainability Research, JLL. Hospitality is a competitive marketplace and sustainability is now increasingly mainstream – partly because social responsibility and the environment are becoming more of a focus area within the corporate world. Strong sustainability is in the longer-term interests of hotels. As Jenowein points out, the hotel industry is linked to climate change; both as heavy consumers of energy and water, but also because their properties are often located in areas most at risk from the effects. “More extreme weather events combined with changing climate patterns could not only influence the attractiveness of tourist destinations in the long-term but could also have more immediate impacts on buildings, natural settings and man-made infrastructure,” he says. This in turn can wreak havoc on local economies that have become reliant on predictable tourist income streams. Siobhan O’Neill, Editor of Green Hotelier, a programme of the International Tourism Partnership (ITP), a charitable membership organisation for leading hotel groups with a combined portfolio of more than 30,000 properties, believes the push towards sustainability is very much coming from those who hold the purse strings within the hospitality industry. While hotel chains from Hilton to Marriott are upping their green efforts, it’s new eco-resorts that are grabbing headlines. Hollywood star Leonardo DiCaprio is aiming to create the ‘greenest luxury development ever built’, with the first Living Building standard Restorative Island scheme at Blackadore Caye, off the coast of Belize. Whereas, over in UAE, the Oasis Eco Resort is laying claim to be the ‘world’s greenest’, in advance of its scheduled opening by ‘eco-minded entrepreneurs’ in 2020. The business travel market is also embracing sustainability – particularly on the conventions circuit, says Dan Fenton, Executive Vice President with JLL’s Hotels & Hospitality Group. Furthermore, they will look beyond the glossy websites. “Mere compliance is not enough,” continues Fenton. “Competing for bookings and customer spend, the hotel or venue’s approach to sustainability must be more than just the token ‘box-ticking’ of green issues. Clients want to see evidence of true commitment to the cause, ideally with a splash of creativity on top. Food waste, for example, has become a talking point in the hospitality industry amid growing interest in redistributing surplus food from hotel restaurants and convention centers to people in need. “Red tape around food production and safety regulations has been a problem for years, keeping the volume of food redistributed unbelievably low, even when it was being gifted, not resold,” says Fenton. In Chicago, The Hilton Chicago has a rooftop farm growing herbs and vegetables that employs teenagers from less fortunate local communities. While hotel groups have different priorities on sustainability, a new wave of innovative initiatives is sending a very positive eco-marketing message. Indeed, sustainable development in the hospitality sector is a market of increasing sophistication and rising significance. As Fenton says: “We are past the ‘please hang up your towels’ phase and have moved into trying to get people to view sustainability in a more holistic way. We want tourists and hotel guests to want to be a part of it. Nowadays, a hotel group’s eco-credentials coupled with a destination’s commitment come into play much earlier in the customer relationship, at the booking stage. Could Harvest Caye be the Caribbean’s New Cruising Hot Spot? ARVEST CAYE, Belize — There’s always been something a little exotic about the idea of a cruise to Belize, a country known for ancient Mayan ruins, lush rain forests and one of the world’s most spectacular barrier reefs. But the reality of visiting the sparsely populated Central American nation by ship often doesn’t quite lived up to expectations. The only port in the country capable of receiving large cruise vessels until now, at Belize City, is a difficult place to land. Passengers arriving on big ships must tender a long way to shore on small boats, a time-consuming and often unpleasant process. Once there, they are dumped into a sometimes seedy neighborhood with little in the way of allures. Some just turn around and head back to the ship. Enter Harvest Caye, a new gateway to Belize about 70 miles down the coast that some in the cruise industry think could transform the experience of visiting the country by ship — and become one of the Western Caribbean’s most popular cruise destinations. Unveiled in November, the sprawling cruise hub is located on a 78-acre island about a mile off the mainland that has the feel of a big Caribbean beach resort. Owned and developed by Miami-based Norwegian Cruise Line Holdings, Harvest Caye features a picture-perfect, seven-acre beach lined with lounge chairs; an enormous, amorphous pool with a swim-up bar; and, notably, its own pier capable of receiving the world’s biggest cruise ships. No more tendering to shore. There’s also an array of water activities such as parasailing and kayaking available as well as zip lining. Harvest Caye also is home to a shopping village, bars and eateries that include a branch of Jimmy Buffett’s LandShark chain. Just a few steps away from LandShark is a kids splash park, complete with a dump bucket and squirting jets. The island also offers an exclusive enclave of upscale, air conditioned beach villas that can be rented for the day for $499. In short, Harvest Caye boasts everything one needs for a relaxing day at the beach, and for many cruisers coming here, that’s exactly what a visit will be. In that respect, it has a lot in common with the self-contained private islands that cruise lines began developing in the Bahamas in the 1970s. Still, Norwegian executives are quick to point out Harvest Caye was not designed as a traditional private island experience. It’s primary role, they say, is as a hub for exploring Belize. During a tour of the island earlier this month, Murphy pointed to the marina from which Norwegian is dispatching excursions to the mainland. Already, the company is selling half-day outings to the Mayan ruins of Nim Li Punit, which are about 45 minutes away. Rain forest river tubing and rafting excursions also are available, and more day trips are in the works, says Murphy. The tours begin with a 15-minute boat ride from the island to a small, Norwegian-developed transportation hub on the mainland in an area known as Malacate. For now, it’s the only way a visiting cruiser can gain access to the mainland. But Murphy says Norwegian hopes to add a water taxi service to the nearby town of Placencia (pop. 1,512) for passengers who want to explore on their own. The service has been delayed due to damage to the town’s dock during a recent hurricane, he says. Murphy says the idea with the beach resort-type development on Harvest Caye is to offer something wonderful for the passengers who don’t go on excursions. Two-thirds or so of cruisers don’t normally sign up for a tour in a destination such as Belize, he says. At ports such as Belize City, such cruisers often are left disappointed. “What would happen in other places is the 30% or 40% who take the tour have a wonderful time, but the remainder don’t, so we wanted somewhere you don’t have to spend a penny (on tours) to still have a great time,” Murphy says. As much as possible, Harvest Caye is designed to offer a taste of Belize to passengers who never venture beyond it, Murphy says. The island’s shops, restaurants and bars are staffed by several hundred locals, not cruise ship workers as is common at cruise line private islands. With a few exceptions, the venues also have a distinctly Belizean theme. In the place of such cruise port staples as Diamonds International and Colombian Emeralds, the shopping area is chock full of locally-operated shops such as Moho Chocolates, which sells chocolates, soaps and other products made from cacao grown on 200 small farms across the country. Local Belikin beer and Belizean shrimp ceviche are menu highlights at eateries. The island also is home to a small outdoor nature center that houses such iconic Belizean wildlife as keel-billed toucans and a boa constrictor — the latter found on the island during construction. Free to visitors, the nature center also offers a walk-through butterfly house filled iridescent blue morpho and Isabella butterflies. Scarlet macaws are on the way. “Some of the ports you go to these days, you come back and think, ‘where did I go?’ because they’re all the same. Same retailers, same restaurants,” Murphy says. Norwegian spent millions on the development, which took nearly three years to complete. The pier alone required a massive amount of work including extensive dredging to allow the biggest ships to reach it and tie up. Its construction was a milestone for Belize, which never has had a pier capable of receiving large passenger vessels. Leave a Comment on Could Harvest Caye be the Caribbean’s New Cruising Hot Spot?